We have a big appetite for chicken, which has directly led to bigger chickens. Modern chickens, known as Ross 308 broiler strain, are four times larger than their counterparts from 1957 and double the size of those from 1978 according to a study published in the journal Poultry Science. 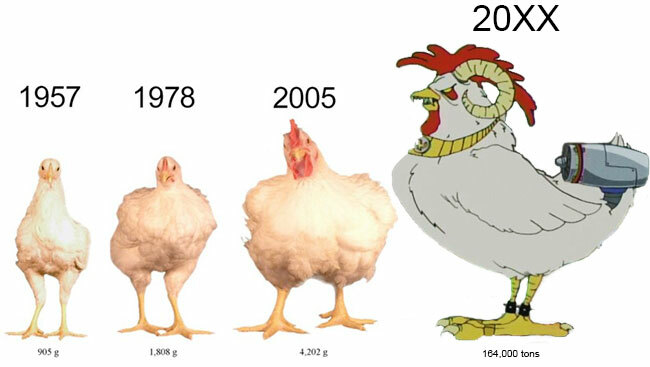 The supersized chickens aren’t the result of hormones, steroids or genetic manipulation but rather selective breeding. Chickens can lay up to 300 eggs a year and chicks become sexually mature as young as 18 weeks. This allows for natural genetic changes to quickly manifest. The industry has long since stopped selective breeding, which resulted in numerous health problems for the chickens such as metabolic disorders and heart attacks. These deleterious effects do not transfer to humans assures Zuidhof.